This is a favorite of mine, great side dish with any meal. We especially like it with chicken and turkey at Thanksgiving. It’s so good it could be dessert! Preheat Oven to 350 F degrees. Coat a baking sheet with nonstick cooking spray. Cut squash in half and scoop out seeds. Season squash with salt to taste. Place squash, cut side down, on baking sheet. Bake 20 to 25 minutes or until almost tender but still slightly firm. Meanwhile, in a small sauce pan, add the cranberries, water, sugar and orange zest and cook on medium heat for about 10 minutes until sauce thickens. Set aside. In a small bowl combine pecans, sugar, butter and ginger. Place squash, cut side up, on baking sheet. Spoon the cranberry mixture evenly into squash halves. Sprinkle with pecan mixture. 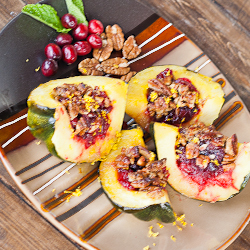 Bake 15 to 20 minutes or until squash is tender and pecans are golden. Remove from oven and let cool several minutes. Cut into wedges and serve.